The eagle is known as Laqwa in arabic. The muscles on the face of victims of facial palsy are pulled that which pulls their mouth outwards giving them a resemblance to a eagle's face. Hence the name Laqwain arabic . Gallen, the Greek physician who supported the humoral doctrine stated that this disease could be due to a problem with a nerve in the face. Both the sexes are equally affected. There is a prodromal stage during which the person can feel pain on the side of the face which is going to get affected. It continues for a day or two until the palsy develops. There is a paralysis of some of the facial muscles. 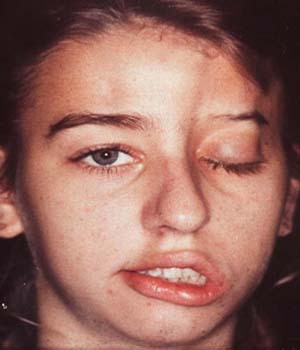 It becomes difficult to close the eyes and mouth on the affected side. The skin on the affected side of the forehead gets stretched and over a period of time gets harder. What does it mean to have a stroke? Strokes (Lakwa in Urdu) are also referred to as a 'brain attack' because of their similarity to heart attacks. It is like having a heart attack in the brain. It means that the blood supply to the brain is disrupted which leads to brain dysfunction. There are two major types of strokes; A) An Embolic or ischemic stroke: this happens when a small blood clot that may be formed some where else becomes lodged in small blood vessels that supply blood to the brain or by plaque formation in it that decreases the size or caliber of the blood vessel. B) A Hemorrhagic Stroke: this occurs when blood vessels, that are supplying blood to the brain, are ruptured. As can be seen, in both the cases the blood supply to the brain or a part of the brain is affected. This affectation leads to brain dysfunction and depending on the region of the brain that is affected, patients suffer the / outcome. What are the risk factors that can cause a stroke? The risk factors for a stroke and a heart attack are similar. Here I will try to list a few. However, one should keep in mind that these are merely risk factors and will not necessarily lead to a stroke. Ethnicity: Native Americans and South Asians (like us) are at higher risk due to more incidences of diabetes and hypertension in these races. Prior history: Which means if one has had a transient ischemic attack (TIA) or mini stroke in the past, that person is at a high risk of having another one. As mentioned before there are some risk factors that we can control. Taking control of these will not only benefit us in lowering the risk of having a stroke but by also lowering the incidence of a number of other diseases that can occur based on our lifestyle. There are also certain risk factors that we can do nothing about but of which we should be aware of. The symptoms may be encountered in an otherwise healthy person and can be deemed normal upsets. However, if a combination of these five symptoms is experienced, then there is due cause to be alarmed. Some times these symptoms are only experienced on one side of the body. Put ordinary rice in a sock, heat this and apply to the affected area. This will relieve any pain or discomfort. Wear dark glasses and keep moisturizing the eyes with rose water. Food particles can lodge themselves between the cheek and gum, so take extra care that this does not happen. Massage your face with olive oil, manually lifting the affected side. This will help your muscles regain flexibility. Try to smile a lot – this also activates muscles. A teaspoon each of raw honey and organic apple cider mixed into a cup of water will help fight any possibility of infection and also add to your general well-being. A method called hyperbaric oxygen therapy is also known to have shown effective results in speeding up treatment of bells Palsy. This is a method of breathing in 100 per cent oxygen, and must be done under medical supervision.